The best just keep getting better, and in the case of Painter 11, it even got a little faster, too. In this newest version of the gold standard software for a real-world painting experience, users will see a marked increase in speed along with 40 new Natural-Media brushes, more intuitive brush customization, resizable Colors and Mixer palettes, PNG support, and a ton of other time-saving features. The revamped selection and transform tools will keep users from jumping to and from Adobe Photoshop ( ) quite so often and once you do open the file in Photoshop, the colors between the two programs will actually match (thanks to an improved color management system). When you’re finished with your masterpiece, Painter 11 will even let you export it and attach it to a new e-mail message for you. By adding this level of functionality, Corel proves that it not only listens to the feedback of its community of artists, art students and teachers, designers, and photographers, but it seeks to make them more productive as well. One of the first things you’ll notice in Painter 11 is that the workspace has been tidied up in variety of ways. For example, the interface color is now totally consistent, and the Show/Hide text in some pull-down menus (the Window menu, for example) has been replaced by a single checkmark to indicate if the palette is hidden or not. The Transform tools have been relocated to a more intuitive home (the Edit menu and Property Bar), and new Hard Media and Color Variability palettes give you quick access to brush customization tools (about which you’ll learn more later). And the aforementioned tidying isn’t limited to the interface, as Corel has also given a nod to the environment in this release. The packaging for Painter 11 is certified green, thereby reducing its carbon footprint, and the reduced electronic pricing certainly encourages downloads. 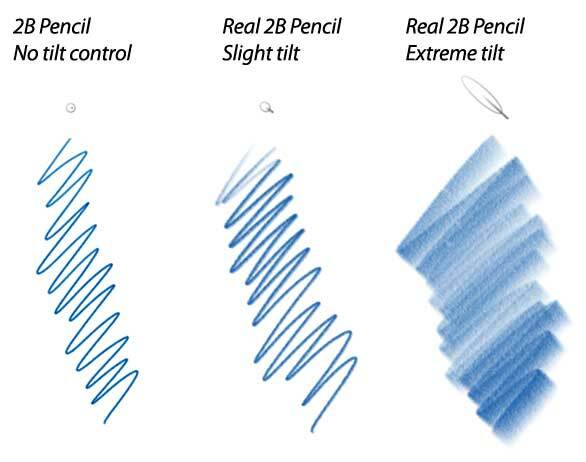 While the RealBristle Painting System—an amazing technology allowing brushes to behave as they do in real life—was introduced in Painter X ( ), version 11 includes 40 new Natural-Media brushes, many of which are specific for drawing and sketching (any brush with the word Real in its name takes advantage of this technology). The new brushes are sprinkled throughout several brush categories and include goodies like a pen that acts like a real-world Sharpie, pencils that you can shade with, a new Markers category, and more. Here you can see the difference between drawing with a regular pencil and drawing with the new Real pencil, which recognizes tilt. The actual cursor is shown above each brush stroke. In Painter 11, many brushes now recognize tilt (brush angle) and the velocity (brush speed) of your stroke when used with a graphics tablet. (To date, all Wacom Intuos tablets recognize tilt, though the Wacom Bamboo ( ) and Graphire ( ) do not.) For example, as you tilt the stylus (or rather, brush) onto its side, your brush stroke gets wider. This means that for the first time ever, Painter artists can shade artwork with a pencil by turning it on its side, just like the real deal. You can also transition between different types of strokes within a single stroke, by merely changing the angle of your stylus. With velocity recognition, you can tweak settings in the Brush Creator dialog box so that an increase in speed produces a thinner stroke, alters opacity, affects color variability, and so on. However, not all brushes take advantage of velocity. This new functionality is most evident when using the Real Pens or Real Calligraphy media, though by tweaking the settings in the Brush Creator, you can alter the velocity recognition so it’s more noticeable on other brushes. The new Markers category contains a slew of markers that actually work like the real thing, meaning you can use them to gradually build color—the more strokes you overlay, the darker the color becomes. This is great news for concept artists and colorists, who often use color to express shadows and highlights, giving their artwork added depth and hand-drawn appeal. A single stroke with a marker, however, produces no color build; and while none of the markers are technically RealBristle brushes, many take advantage of tilt and pressure recognition. Do a little digging in other categories like acrylics, calligraphy, chalk, charcoals, conte crayons, and oil pastels, and you’ll find even more new Real brushes. The new Real Variable Tip Pen in the Calligraphy category is handy for creating digital signatures and the new Real Blenders are great for working with color in areas of fine detail. Lest the new brushes get all the attention, the older ones also appear to have been improved and do a better job of imitating their real world counterparts. 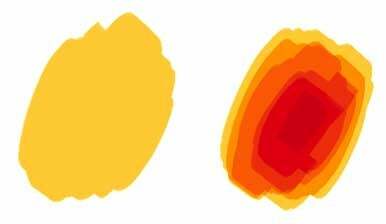 For example, the watercolor brushes are not only faster, but they seem to respond more accurately to settings like tilt and pressure too. Here you can see the difference between color created with a single marker stroke (left), and that of a color buildup made with multiple overlapping strokes (right). Brush customization also got a little easier with a new Hard Media palette and a more accessible Color Variability palette (the latter had been buried deep within the Brush Creator). Experimenting with Color Variability is a great way to introduce texture and can keep your art from looking too digital and smooth, as if it were plastic. As always, Painter remembers any changes you make to brush variants (Corel’s name for attributes), as opposed to Photoshop, where the brush settings are global; that is, unless you’ve saved custom brushes (and even then settings like opacity are still globally controlled). This makes sense once you realize Photoshop wasn’t built specifically for painting; it’s always been an image editor first. Instead of switching over to Photoshop for selecting and transforming, you can now do much of that in Painter—a big time-saver. In Painter 11, clicking on the selection tool in the Toolbox opens the Property Bar (if it’s not already open) where you can choose between four different selection tools, including the new Polygonal Selection tool. It works similar to the Polygonal Lasso tool in Photoshop and allows you to draw straight lines by simply clicking and dragging, though you can also drag to draw a freeform selection. Also new is the ability to select layers (or parts of layers) using keyboard shortcuts. For example, to select a layer, simply Command-click the layer thumbnail (just like Photoshop). To select additional layers, Command + Shift-click the thumbnails. Long-time users will also appreciate easier access to more intuitive Transform tools. Not only is there a Transform tool in the Toolbox, but now you can also access both Transform and Free Transform from within the Edit menu (they used to live in the Effects > Orientation menu). Once you’ve summoned the bounding box of Free Transform, you can use the handy Rotate, Skew, Distort, and Perspective Distortion buttons in the Property Bar to do your bidding. If you’re transforming an entire layer, no selection is required. If you’re transforming part of a layer, you must create a selection first. Also new in Painter 11 is a much improved color management system. Just pop open the Canvas menu and you’ll spot several new options toward the bottom (you can also press the new rainbow-colored icon toward the top right of each document window). With these settings you can easily control the color profiles of new or existing files—of varying file format— thereby improving color workflow and accuracy between programs. Simply put, you’ll suffer no more color shifts when opening Painter files in Adobe Photoshop, or vice versa. You can also change the color profile of your document so that it matches your client’s in order to see the same thing they see. Finally, the new color proofing option lets you simulate how your art will look when printed with various profiles like U.S. Sheetfed (coated or not), U.S. Web Coated (SWOP), and so on. 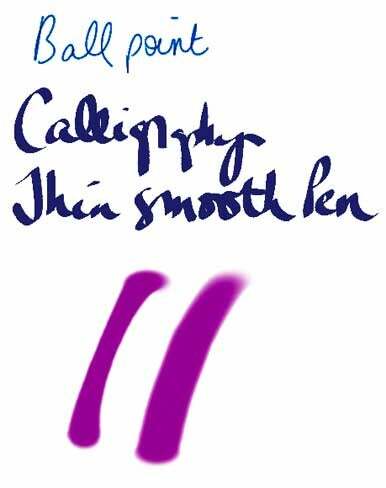 It’s easy to see the result of tilt recognition when you contrast the results of writing with the Ball Point vs. Calligraphy Pen, as shown here. Bottom: The new velocity recognition lets you control the stroke width of some brushes (Calligraphy Real Variable Tip was used here). The stroke on the left was drawn much faster than the one on the right, thus it’s thinner in the middle. After spending some time with the program, you’ll notice a distinct speed boost on Intel Macs. However, some brushes still take a few seconds to resize (it’s especially noticeable at 100 pixels or higher). When you change brush size, Painter has to rebuild the different paint dabs used for creating each stroke; the extra render time happens because the really big dabs take a little more time to create. Among other notable new features is the ability to save your masterpieces in PNG format (PNG-8 and PNG-24), which includes full transparency support. If you need to e-mail artwork to a client or other team member, Painter can help with that too. Just choose File > E-Mail Image and pick a format (JPEG, PNG, or TIFF) in the resulting dialog box. If you choose JPEG, you use the slider to determine quality (and thus file size). Painter will then scour your Mac for installed e-mail clients and display them in a pop-up menu. Choose the client of your choice and Painter will launch the program, open a new message, and attach the file; all you have to do is fill in the blanks and click Send. That’s definitely working smarter instead of harder. While the speed boost alone may not be enough to reach for your credit card, the new Real brushes (especially the Real pencils), marker buildup, intuitive transform tools, and color management make it a tempting expenditure (the reduced cost of the electronic version makes it even harder to pass up). With these improvements, users can truly focus on creating art, solidifying Painter 11 as the ultimate digital art studio.